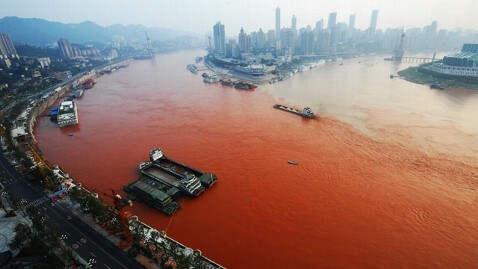 The longest river in China and the third longest river in the world has suddenly turned red for an unknown reason. The river known as the "Golden Waterway", red is a color rarely seen. However, that is the shadow appearing on the Yangtze River and officials have no idea why. The red began to appear on the Yangtze, the longest river and largest in China and the third longest river in the world, near the city of Chongqing, where the Yangtze River connects with Jialin. The Yangtze, called "Golden" because it receives heavy rainfall throughout the year, runs through Chongqing, the largest industrial and commercial center in the southwest of China, also known as the "Mountain City" for the hills and peaks in its many buildings and factories. The red color stopped some residents in their tracks. They put the river water in bottles for storage. The fishermen and other workers who depend on the river for income proceeded with their business, according to the news media. While the red color was more pronounced near Chongqing it was also reported in several other places.Authorities are investigating the cause.